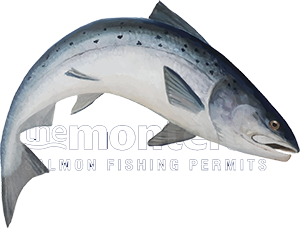 Having a good understanding of where to locate salmon in any water height is always going to give you a distinct salmon fishing advantage. Throwing a fly out into the river without any thought as to where fish may be holding is logically not going to give you the optimal chances of success compared to a carefully swum fly that's targeting certain likely salmon holding areas of the pool. In high water conditions salmon tend to be put out of their normal holding areas by the increased water pressure and will take refuge in the slacker deeper water at the side of the river. The fishing tactics during high water conditions should be a careful short lined approach with particular attention being paid to the edges of the stream that can be as little as one rod's length away from the riverbank. Obviously if salmon are holding in these short range areas during high water your approach needs to be very controlled and stealthy to give yourself the optimal chance of success. I've seen so many fishers approach such conditions by wading right through these riverside areas and still trying to fish a long line to the middle river low water holding areas without realising the salmon lies have changed. During thse high water conditions a light sink tip with not too heavy a fly is the order of the day so the fly can fish right into the grass verge or riverbank stones without getting snagged or bottoming out while fishing through these likely high water holding areas. On many ocassions when I've given this advice to anglers who ignored what I was telling them I've seen salmon show between their wading position and the riverbank while they were fishing. High water conditions hardly requires you to be in the river at all and if you stay out of the water and fish a short controlled salmon fly you will increase your chances even further. You'll then be in maximum stealth mode with little chance of spooking any close lying salmon. Look for that calmer deepish water at the edge of the river and get your salmon fishing tactics correct if you want to experience salmon fishing success during high water conditions.